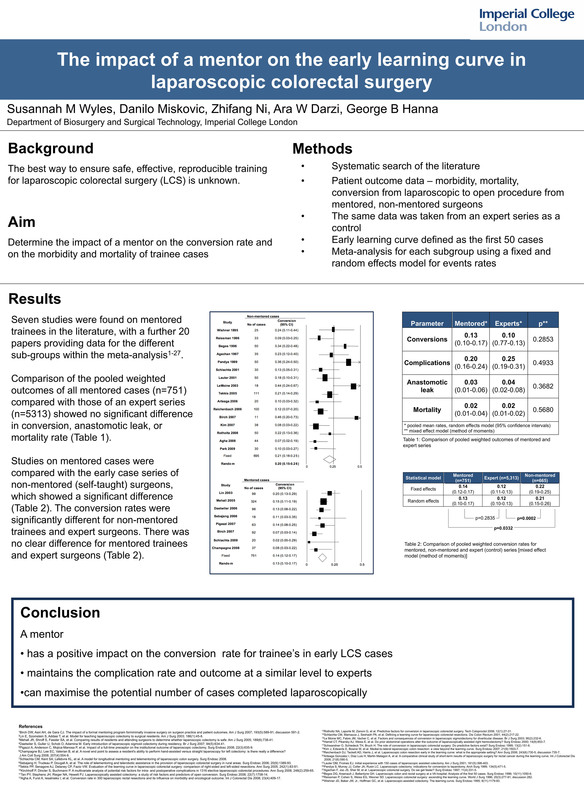 The aim was to systematically review the literature and determine the impact of a mentor on the conversion rates and outcome data of trainee cases.The best way to ensure safe, effective reproducible training for laparoscopic colorectal surgery (LCS) is unknown. The traditional “master-apprentice” model for learning surgery is gradually being replaced by alternative training techniques due to a change in the working pattern and demands on the modern surgeon. The actual necessity of a master or “mentor” to be present in theatre or available via a video-link during the trainee’s early LCS learning curve is yet to be proven. Two authors performed a systematic search using OVID databases to find reports on patient outcome data from mentored and non mentored training surgeons and expert surgeons. The early learning curve was defined as the first 50 cases. Seven studies addressed the impact of a mentor’s actual or remote presence on a trainee’s performance. A comparison of the pooled weighted outcomes of all mentored cases (n=751) compared to those of a large expert case series (n=5313) showed no significant difference in either conversion, anastomotic leak, or mortality rate. Furthermore, studies on mentored programmes were compared with the early case series of non-mentored (self-taught) surgeons. Only data for conversion rate was available which revealed a significant difference, supporting the mentored group (13% mentored, 20% non-mentored, mixed model p=0.0332, fixed model p=0.0005). The conversion rates were significantly different for non-mentored trainees and expert surgeons (20% vs 11%, both models p<0.0001) but there was no clear difference for mentored trainees and expert surgeons (13% vs 11%, mixed model p=0.2835, fixed model 0.0127). This meta-analysis demonstrates the positive impact of a mentor on the conversion rate for trainee’s in their early LCS learning curve. A mentor can provide further benefit for patients by maintaining the complication rate and outcome at a similar level to experts and can maximise the potential number of cases completed laparoscopically. Mentoring trainees reduces conversion rate in laparoscopic colorectal surgery.